It is my pleasure to welcome you to our school’s digital prospectus. I am extremely proud to lead a team that is committed to achieving high standards and providing the very best opportunities for the children in our care. Staff, supported by governors, work hard to deliver a rich and challenging curriculum; to prepare children for future education; and to help them acquire the skills and enthusiasm needed to pursue learning for the rest of their lives. The best way to find out about our school is to come and visit, to see us in action and meet the staff and children. A telephone call to the school office on 01827 475778 is all that is needed to arrange this. School starts at 8:55 am and registers are taken at 9:00 and we have started our learning by 9:05 am. We think that it is really important that we all get to school on time ready to start. Please let the school know if your child is absent by contacting the school office by 9:15 am. We all have a morning break but the times are slightly different depending on which Key Stage you are in. Lunch starts at 12:00 for children in Foundation and Key Stage 1 and at 12:10 for those in Key Stage 2. Our afternoon learning starts at 1:05 pm. The end of the school day is 3:10 for KS1 and 3:15 pm for KS2. Key Stage 1 Class teachers should be informed beforehand if someone else is collecting your child from school. There are a range of after-school activities ranging from dance, Villa football training, athletics, gymnastics, art and homework, taking place each night after school. At Florendine we aim to provide a welcoming environment and opportunities for children to become independent and active participants in their own learning. We have high expectations of our children and ensure that they have the opportunity to achieve their full academic and social potential. Enjoying school and achieving our potential. It sets out a clear, full and statutory entitlement to learning for all children aged five to eleven and determines the content of what will be taught. We have a great many adult helpers and work placements in school and we always welcome new volunteers. It is preceded by the Early Years Foundation Stage Curriculum which is taught to children aged three to five. Develop the essential literacy and numeracy skills they need to learn. Develop the attitudes, understanding and skills to become successful, independent learners. Develop personal values, qualities and attitudes and be respectful of other people and their views and opinions. Develop appreciation and concern for the environment. Work toward achieving their potential. Physical Education plays a very important role at Florendine. Pupils experience a full program of activities in line with the national curriculum for KS1 and KS2. They also have numerous options to participate in a wide range of and afterschool sporting clubs and competitions. Physical Education is concerned with the promotion of positive attitudes towards physical activity and well-being. At Florendine Primary children are helped to acquire the skills needed to participate with confidence and enjoyment in a range of individual team activities at school and in the wider community, and to appreciate the place of regular exercise as a way of keeping fit. All children take part in a minimum of 2 hours of high quality PE and sporting activities each week provided by class teachers and/or a professional sports coach. A well-balanced programme of sporting activities is provided for the children that includes opportunities for expressive and creative movement through dance, as well as gymnastics, swimming, athletics, games and outdoor and adventurous pursuits. Learning through co-operative and competitive activities helps to promote an understanding of inter-personal relationships. All Children are provided with the opportunity to explore and develop their own ideas through music. The teaching of music is based on three elements: Listening, Composing and Performing. 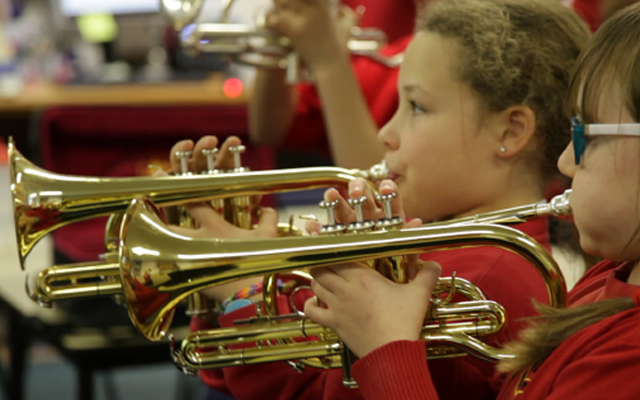 Participation and enjoyment play an important part of the musical curriculum. From an early age children participate in a wide variety of musical appreciation from our own and other cultures. ‘The personal development and well-being children is of paramount importance. From the ‘Gifted and Talented’ to those requiring support from our dedicated special needs teacher, all children are valued and have a right to the first class education that is provided here at Pennine Way. We are recognised in particular for the work we do in the area of ‘Special Educational Needs’. A variety of peripatetic music teachers are in school each week to teach groups of KS2 children. Each child in Key Stage has their own instrument provided either string (in Y3/4) brass (inY5/6) and they have a whole class lesson each week. The children are then able to take the instrument home to practise further if they wish. In addition all of our Year 2 children receive a weekly lesson on the recorder. In the Reception Year, the curriculum is planned and resourced to take children’s learning forward and to provide opportunities for all children to succeed in an atmosphere of care and of feeling valued. Literacy Development involves encouraging children to link sounds and letters and to begin to read and write. Children must be given access to a wide range of reading materials. From the outset we want to work in partnership with parents to secure the best possible outcomes for all the pupils at our school. We have an open door policy and a caring and supportive staff who are always willing to find the time to discuss any aspect of your child’s time at school. Members of the classes are elected by their classmates to serve on the School Council. This introduction to the democratic process is fundamental to their developing understanding of one of the fundamental values that we cherish. These children, together with a staff representative form a committee, which meets to discuss all aspects of school life. The Councillors bring forward ideas and suggestions which come from the main pupil body. We value the ideas and opinions of the children, which gives us the opportunity to see things from a different perspective. The council has become an important aspect of school life. It gives the children the opportunity to become more involved in the decision making process. They are becoming more independent and are starting to take ownership of improvements made in school.